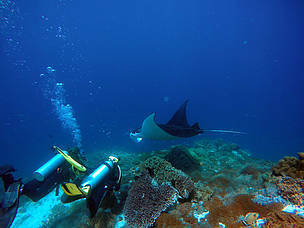 Manta Point is the most popular tourist destination in West Maggarai Regency. 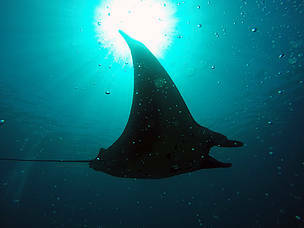 As one of famous rescue points in Komodo National Park, this spot promises the tourists a visit with mantas. Beside this spot, some other spots for visiting sharks are also favorable among tourists, like Batu Bolong. The challenge of diving against the current does not deter diving enthusiasts to keep coming here. At least in the last six years, Komodo National Park has increased its visitors by 10,75%. This high number of visitors can also impact the natural resources if they are not responsibly managed. This also affects the tourists’ comfort when they visit the diving spots. The increasing number of visitors in shark and manta diving spots without any governance, as well as the lack of obedience toward the human-animal interaction rules, have brought a thread to some of these locations. Therefore, since November 2015, WWF-Indonesia together with Balai Taman National Komodo, has conducted a study on carrying capacity, an observation of sharks and mantas. Some locations that become the research center are the shark rescue point in Batu Bolong, Castle Rock, Crystal Rock, Golden Passage, Manta Alley, Manta Point (Karang Makassar), Mawan, Pengah Kecil, Tatawa Besar, and Coulderon. Attended by 24 participants, mostly Dive Operator representatives and the regional government of West Manggarai Regency, the early consultation on the analysis of an ideal daily diver capacity in each locations was discussed on April 11th, 2016. In this occasion, an academician from Univeristas Hasanuddin, Ahmad Bahar explained that the measurement on carrying capacity is based on the physical capacity and tourists’ comfort. His result shows that 9 diving spots for shark visit has the carrying capacity of approximately 10 – 319 visitors daily, and 3 spots for manta visit can contain 52 – 365 visitors for daily visit. These numbers are to be the basis to manage the underwater tourism which is not only comfortable for tourists but also eco-friendly. Based on a survey done one 180 tourists from various countries visiting and diving at Komodo National Park, 33% of respondents state that they are interested because of the main attraction, the sea animals like sharks and mantas, 29% because of the bio-diversity, 13% due to the underwater view, 10% of them want to see komodo, and the other 15% are interested in photography and the local culture. This shows that the underwater tourism visiting sharks and mantas is the main attraction for tourists to come. 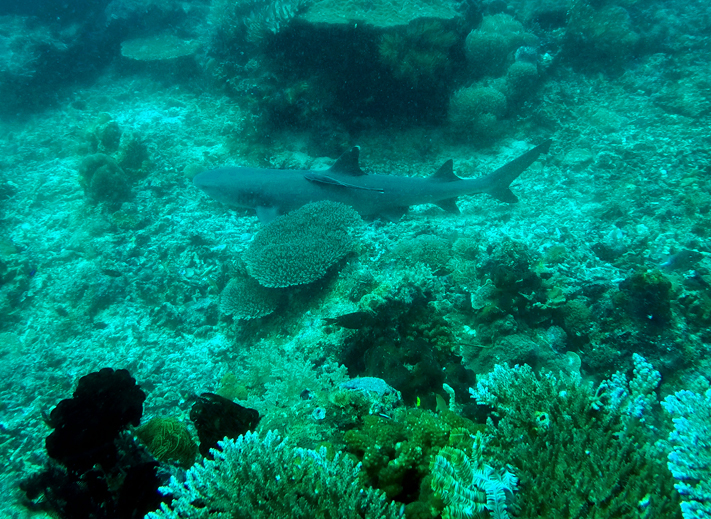 The thread on shark and manta population in West Manggarai Regency waters will directly impact the sustainability of tourism in this location. The study on carrying capacity should not halt on the daily diver capacity. However, it should continue to the formulation of management and organization procedures, including the quota distribution for dive operators and the practices of responsible underwater tourism. In order to support this, WWF-Indonesia has created the BEEP (Best Environmental Equitable Practices), A Series of Responsible Nautical Activities, Observation and Interaction with Marine Animals. These guidelines are conducted as a reference for tourists and tourism service providers to act responsibly during their trips.